Martin St. Louis returned to the Gutterson Fieldhouse, where prior to his NHL career, he starred as a member of the University of Vermont Catamounts. Martin St. Louis, the outstanding forward who fully blossomed with Tampa Bay this season, got the opportunity to split in two his time with the Stanley Cup. He took hockey's historic vessel to South Burlington, Vermont on Thursday, July 29, then enjoyed taking Lord Stanley's legacy to Laval on Tuesday, August 10. 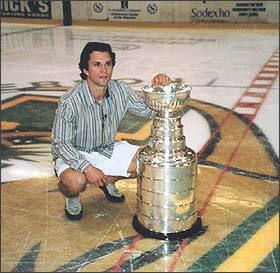 South Burlington is the home of the University of Vermont, where Martin St. Louis is a proud alumnus. The campus offers a stunning vista of the area; perched on a hill that overlooks Lake Champlain at the foot of the Green Mountains. The view is breath-taking, but early on July 29th, students and locals were holding their breaths for another reason  Martin St. Louis would be bringing the Stanley Cup to the University of Vermont. The Cup arrived early  7:30 to be exact  but St. Louis was already outside waiting for the trophy along with neighbours and local police. 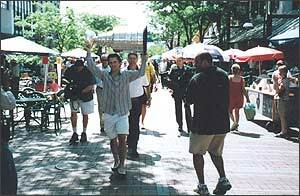 Martin took the Cup to the Sheraton Burlington Hotel, where generous hockey fans made donations to get a photograph with St. Louis embracing the Stanley Cup he had so excitingly helped his team win. More than 3,000 people visited the Sheraton, raising a substantial amount of money on behalf of Jimmy Giroux. Just shy of his first birthday, Baby Jimmy was diagnosed with acute myelomonocytic leukemia, and has been receiving intensive chemotherapy treatments and a bone marrow transplant. Martin's very generous contribution relieved much of the financial pressure Jimmy's family has been facing. 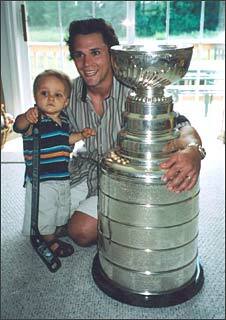 Through the kindness of people like Martin St. Louis, Baby Jimmy is receiving the best medical attention possible. "Is that what I think it is?" asked astonished pedestrians as St. Louis carried the coveted Cup down South Burlington's Church Street. St. Louis starred with the University of Vermont Catamounts of the ECAC prior to the initiation of his NHL career, so chose to bring hockey's highest honour home to his alma mater. St. Louis and the Cup visited the Gutterson Fieldhouse, where he had played so often and so spectacularly, and had his photo taken on the logo at centre ice. Colleagues and staff then had their pictures taken with Martin and the Stanley Cup. 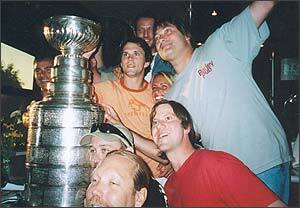 "Hey guys, I gotta take the Cup to Church Street and show the people," St. Louis blurted. "It'd look awesome and think of the reaction!" He, of course, was correct. Church Street is a wonderful, busy street now closed off and has become a pedestrian mall. It was a sunny day and the street was packed with people, who did double-takes that almost caused whiplash when they saw Tampa Bay's star parading down the street's corridor holding the Stanley Cup aloft. "Oh my God! It's the Stanley Cup," more than a few people exclaimed, and a warm, spontaneous eruption of applause broke out from patios along the street. As Martin hoisted the Cup, a guy riding a bike accidentally came close to hitting St. Louis. Now, he's been checked by the best  guys like Jarome Iginla do it for a living, and Martin deftly is able to scoot away and avoid the hit. But while holding the trophy over his head in a crowd of people  that manoeuvre was a little more tricky! 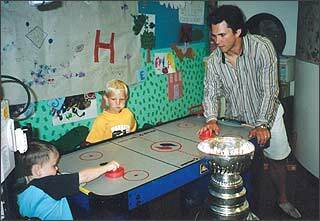 Little Connor challenged the NHL's most valuable player to a game of air hockey at the Fletcher Allen Health Care hospital. St. Louis carried the Cup to the end of Church Street where he posed in front of one of the town's landmarks  surprisingly, a church! The next stop was Fletcher Allen Health Care. Martin took the Stanley Cup into the children's ward of the hospital to meet the kids there. Ordinarily, the patients might have been intimidated to meet a hockey hero, but Martin was so cool and good with the children. "Hi I'm Martin," he'd say, extending his hand and smiling broadly. "How ya doin'?" He played a game of air hockey with Connor, one of the patients there. Martin kept it close but Connor won the contest. St. Louis's parents and some friends showed up at the Cairns Arena, run by one of Martin's friends' fathers. They were all very proud and thrilled to see Martin with the Stanley Cup he had worked so hard for. At the Quarry Hill Club, Martin got to sing and party with one of his favourite bands -- Sean Kelly and the Samples. Page McConnell from Phish got up to jam with them, too! 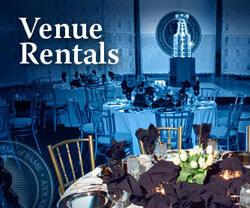 A private party took place at the Quarry Hill Club. The former gravel pit has been turned into a fantastic club located in the depth of where the quarry once existed, while limestone walls surround the facility. Swimming pools and tennis courts have built into the cavity, too. There, one of Martin's favourite bands performed  Sean Kelly and the Samples. At one point, St. Louis actually got up on stage and joined the band, who were only too happy to become the back-up band for a Stanley Cup champion. Also in the crowd was Page McConnell from Phish, the legendary touring band whose fans travel across the continent to see them perform. Although the band has recently been brought to a conclusion, the Burlington group still plays frequently in various configurations, and on July 29, Page McConnell played with Martin St. Louis and the Samples. After the show, Martin sat on the Samples' tour bus, talking with the boys in the band. At 3AM, it was time to say goodbye. "I had an awesome time," said St. Louis. That statement would be repeated several weeks later. 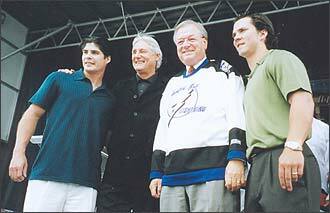 Long-time friends and teammates, Eric Perrin (left) and Martin St. Louis (right) presented Laval mayor Gilles Vaillancourt with a championship Lightning jersey. Both Tampa Bay boys were honoured with a City of Laval council medal. For Martin St. Louis's parents, the morning of Tuesday, August 10 began at 6:30 when the Stanley Cup arrived at the door of their lovely Laval, Quebec home. They took the Cup inside, even though their son had yet to arrive, but as designated, by seven o'clock, Martin showed up ready to rock. The first stop was at Canada Post, where Martin's father works. The staff was delighted to get photos taken with Martin and the Stanley Cup. Then, it was off to a civic reception presented by the City of Laval for two of its most celebrated ambassadors -- Martin St. Louis and Eric Perrin, great friends and teammates. With Martin's wife Heather and son Ryan looking on, Mayor Gilles Vaillancourt presented St. Louis and Perrin with the City of Laval Council Medal. 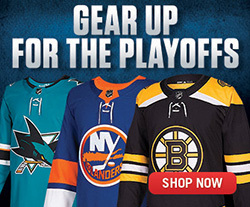 "You have both overcome numerous obstacles on your way to the National Hockey League. You are courageous and determined. You've never stopped believing in your abilities and in the goal you set for yourselves. You deserve our heartfelt admiration," the mayor stated to enthusiastic applasuse. Martin and Eric then met with minor hockey players at the Samson Arena, where Martin played his minor hockey. The young star presented a cheque for $10,000 to minor hockey in Laval. Afterwards, the Tampa teammates took part in a celebration at a plaza near the St. Louis home at which 2,500 fans attended. Martin St. Louis returned to his parents' home in time for a street party that had been set up. The street was cordoned off and tents set up. By this point, the Stanley Cup was joined by the other trophies St. Louis won this season -- the Art Ross, Hart and Pearson trophies. Seven hundred 'neighbours' partied through the afternoon with local boy made very, very good. Join us Monday here at Stanley Cup Journal when we discover how Ben Clymer celebrated on his day with the Stanley Cup. Kevin Shea is Manager of Special Projects and Publishing at the Hockey Hall of Fame.